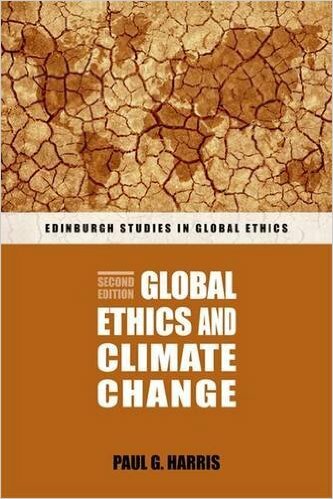 Paul G. Harris, Global Ethics and Climate Change, 2nd. edition (Edinburgh University Press, 2016). Climate change is the world’s greatest challenge. Solutions to it can be found in global ethics. With each passing year, the causes and consequences of climate change grow worse: more pollution from more people and more countries, leading to more adverse environmental changes and widening human suffering. The failure of governments to address climate change effectively has never been more evident. Making the connections between global ethics and climate change, and acting on those connections, has never been more urgent. Building on the ethical and political analyses of the first edition, this edition updates the science and impacts of climate change, exposes the increasing intensity of dangerous trends – particularly growing global affluence, material consumption and pollution – and highlights the intensifying moral dimensions of resulting changes to the environment. In so doing, the book shows readers how vital global justice will be to our common future. Alas, it is too late to stop climate change. It is not too late to reduce the untold injustices it portends.